Histamine is an important mediator of allergic diseases such as hay fever and bronchial asthma, food allergies, urticaria, and drug hypersensitivity. Knowledge of histamine as a cause of numerous non-allergic symptoms and signs is, however, limited. 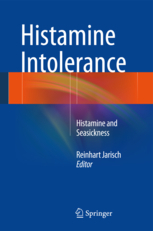 In fact, histamine intolerance can be responsible for conditions as diverse as seasickness, headaches and migraine, tachycardia, gastric disorders, diarrhea, intolerance to contrast media, parodontosis, period pains, nausea and vomiting in pregnancy, atopic dermatitis, and osteoporosis.This book offers wide-ranging coverage of histamine intolerance. There is extensive background discussion of the origin of histamine, its content in food and alcoholic beverages, and intolerance to red wine. Diagnosis of histamine intolerance is explained, and the various symptoms of histamine intolerance are clearly described. Subsequent chapters cover the conditions mentioned above and also consider the relation of histamine to vitamin B6 and the specific immunotherapy of allergies.